​The Commonwealth War Graves Commission has listed 256 war graves in Wallasey Cemetery, with individual locations. See www.cwgc.org to find a cemetery. In addition, there are hundreds of memorials to war dead on family graves, throughout the cemetery. Wallasey endured its first bombing attack on August 10th, 1940. The 35th and last raid on Wallasey took place on November 1st, 1941. In the raids of Christmas week, 1940, 119 people lost their lives and 91 were seriously injured. One of the most sustained periods of bombing, when parachute mines were used extensively, was during the March blitz, 1941. In three days of continuous bombing, 186 people were killed and 196 seriously injured. 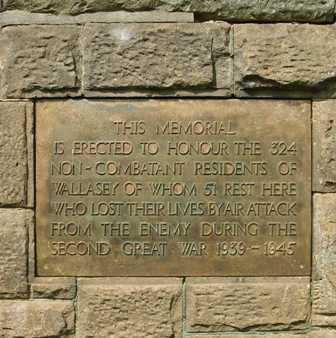 Thus, most of the total non-combatant deaths, recorded on the memorial plaque, occurred during these two bombardments.